Almost four years ago to the day, Lowery and I sat down with Dr. Thomas Taylor, then Superintendent of Middlesex County Public Schools. We had one goal – to pitch a MWEE (Meaningful Watershed Educational Experience) program and include Middlesex County in a large three year grant to support the program. Dr. Taylor was more than agreeable; he was excited for the opportunity! Dr. Taylor shared that in Middlesex County their biggest export is their brightest students. They leave for college and don’t come back. He asked if our program could help his students see opportunities for careers in their home. He asked if we could help the students understand how special their area is so they might see the potential for a local career. What he wanted was to create a sense of place for his students. As FOR, our program would be river-focused. First, we would showcase natural resource professional career opportunities through our long list of partner organizations. Second, we would highlight fisheries, particularly the oyster industry and oyster restoration efforts. That was the beginning of a successful partnership in Middlesex County that still flourishes today. Through grant programs from NOAA and the River Counties Community Foundation, FOR was able to purchase water quality testing technology and provide support to teachers to help them better use the technology with their students. The teachers in Middlesex have embraced the program. They are eager to give their students an authentic learning experience that is centered around their river community. This year we brought our stormwater sediment filtration STEM challenge to 6th graders at St. Clare Walker Middle School. The students learned about human land uses including the different ways pervious and impervious surfaces affect the stormwater runoff. They designed filters to trap dirt out of water samples. They tested the turbidity of the samples with probeware before and after water was poured through their filters. 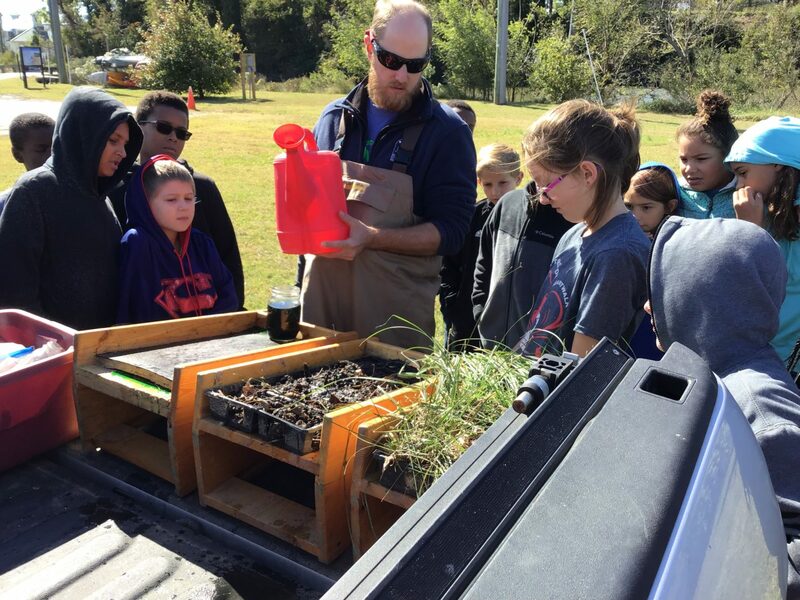 Students were amazed to know that some engineers are focused solely on ensuring the cleanest water possible passing through stormdrains while heading directly to the Rappahannock River. 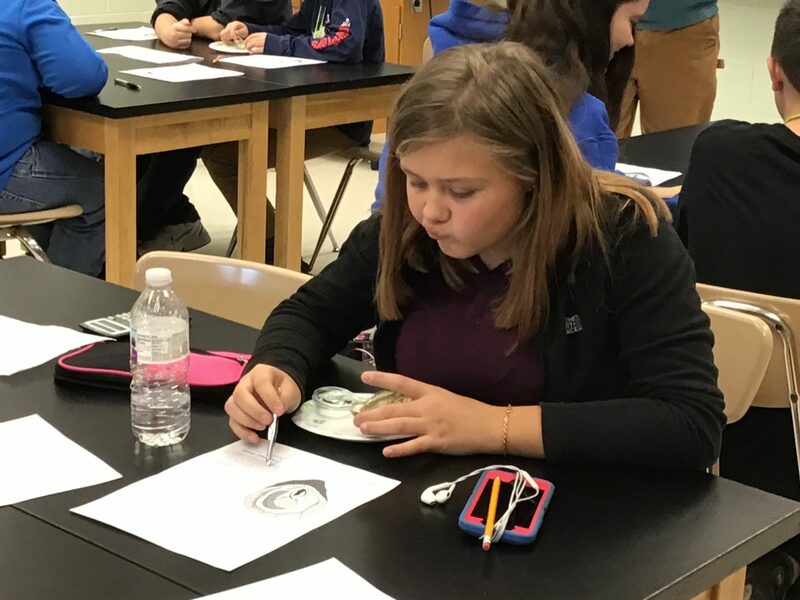 Seventh graders this year delved into the cultural, economic and ecological impact of oysters in their region of the Rappahannock River. After an introduction on the relevance of oysters in their location, we brought live oysters to their classrooms and shelled them. We led the students through oyster dissections, pointing out the features of this animal that has such great importance, both nutritionally and economically throughout history in their area. Many of the students come from watermen families. They were excited to share knowledge of a subject that is second nature to them. Both the seventh and eighth graders met up with FOR educators at Urbanna Town Marina for two days of outdoor discovery at a place that is culturally significant for them. The Urbanna Oyster Festival is host to 70,000 tourists each year on the very location they learned about the importance of water quality monitoring. They used probeware and chemical kits to test the quality of water and discuss whether it fit into healthy parameters. They witnessed a demonstration of how various surfaces allows different levels of sediment to flow off the land into the Rappahannock. And, finally we showed them three different types of oyster restoration beds located right in the marina. Each type offers the hope for a renewed oyster health and population for the future. These students expressed excitement while taking part in hands-on activities that are a part of their combined heritage and culture. Prior to dissecting oysters with a group of students, we talked about the rich history of their town, built around oysters, oyster festivals, and oyster shucking competitions. The students guessed it would take a competitor 12 to 23 minutes to shuck one dozen oysters. After I informed them that local legend, Deborah Pratt, can shuck two dozen oysters in under three minutes, one girl looked up and proudly exclaimed, “Deborah Pratt is my grandma!” We witnessed the pride of students sharing their family knowledge of subjects that are part of their normal discussion during home life. And, we saw the enthusiasm of students who live so close by the Rappahannock River yet have never been privy to its abundant value and resources. 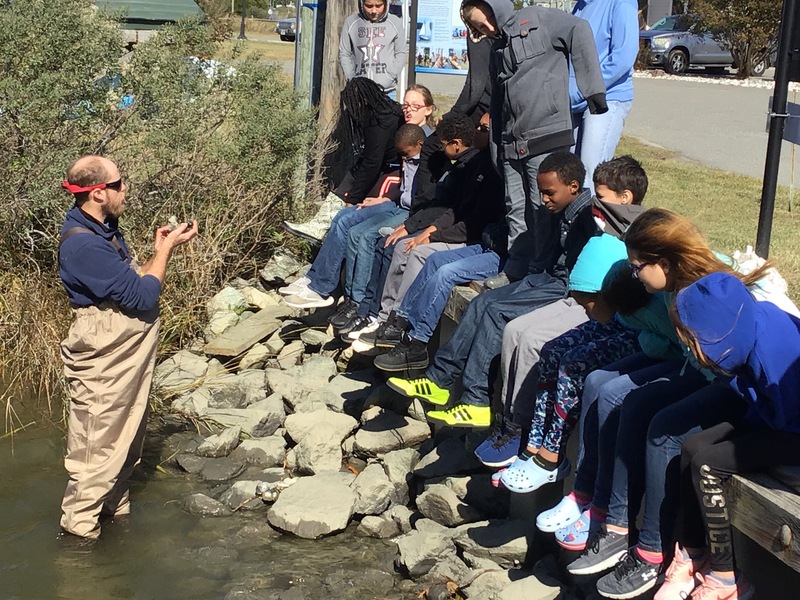 Connecting young students to the area they live gives them a place to firmly plant their roots, much like placing oysters shells back into the Rappahannock gives young oyster spat a place to strike and grow into healthy, productive oysters. Both oysters and growing young people have an interest and an invocation to create a healthier Rappahannock River and Chesapeake Bay.